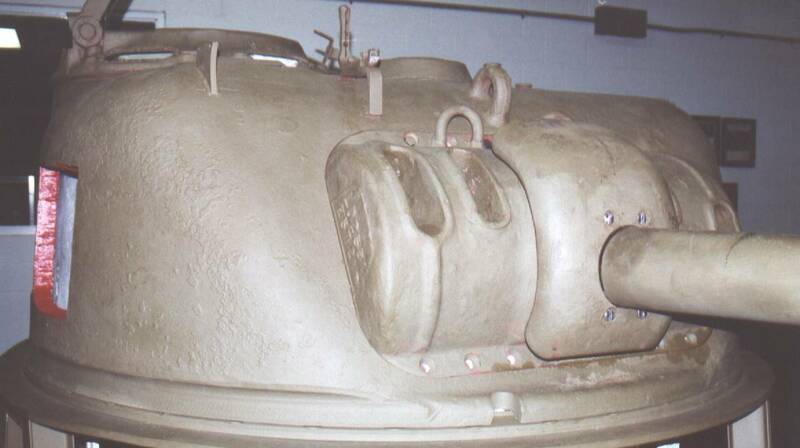 they show the altered turret casting contour. 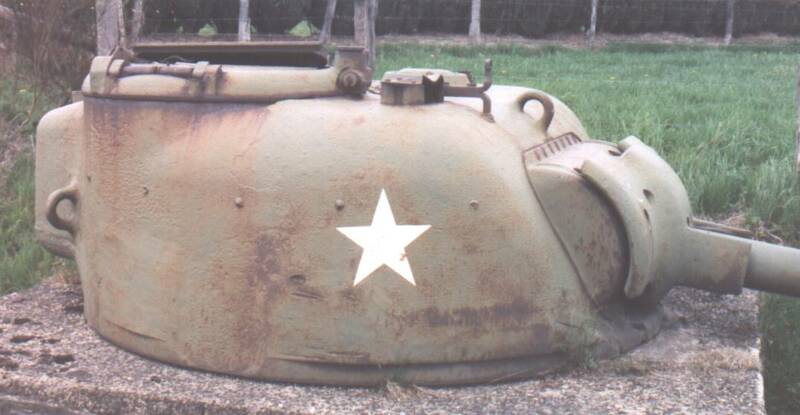 This turret has a M34A1 type gun shield meant to be used with the wide rotor shield (i.e., mantlet) as seen below, but a narrow M34 rotor shield has been used instead. In all likelihood the turret is a casting reject put to better use. 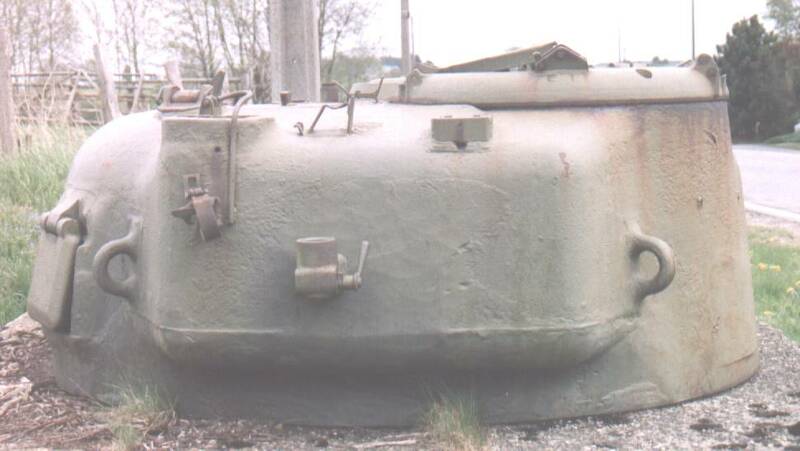 The section views show how the turret wall gets thicker toward the front, and the fire control mechanism that the armor was originally thinned in order to clear. 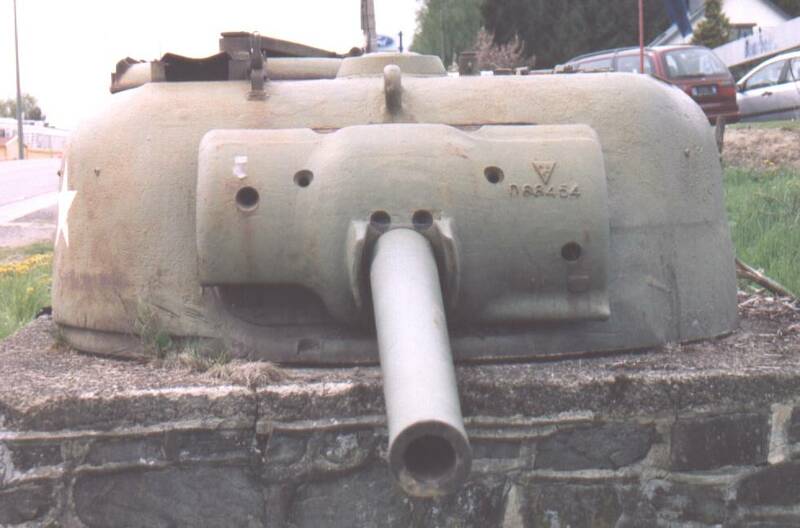 This set of photos is of a turret mounted as a monument outside Bastogne, Belgium. The undercut of the bulged contour is quite visible. Note the casting mold line on the rear of the bustle. 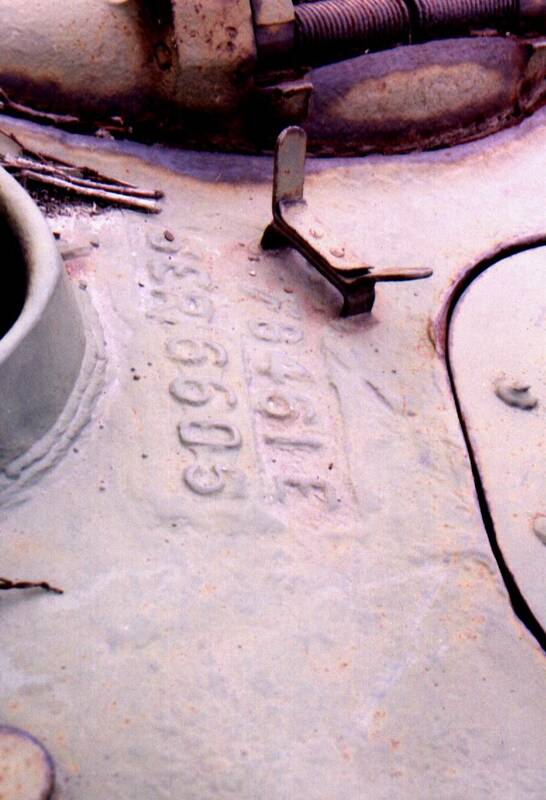 This picture shows the markings on the turret. 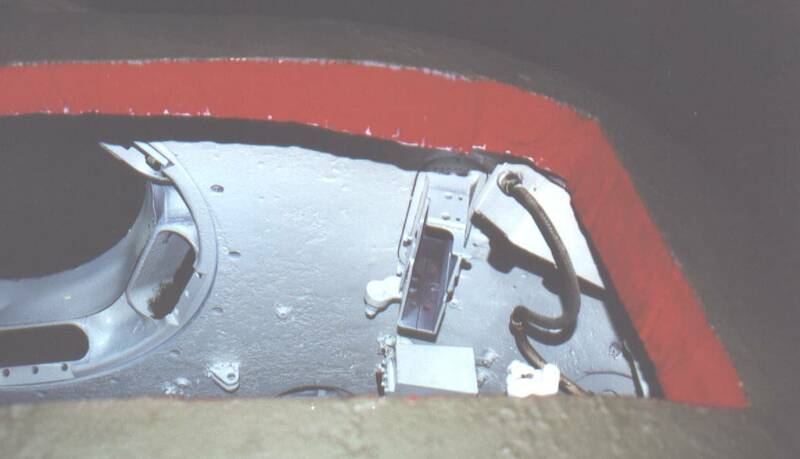 They are shoehorned into the space in the turret roof center between the TC's and loader's hatches and the ventilator. The clip is the remains of the AAMG barrel clamp. 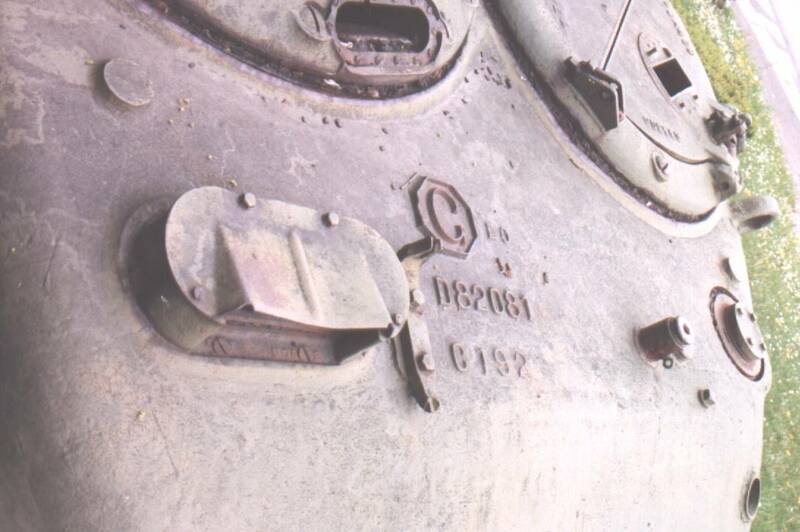 In addition to these marks, there is a General Steel Castings logo on the top center of the bustle between the antenna sockets. 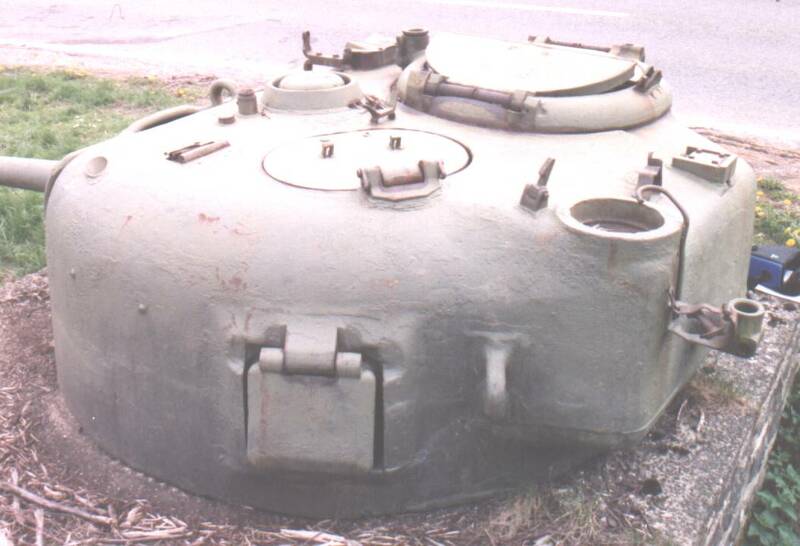 This is an early 76mm turret as evidenced by the circular loader's hatch. 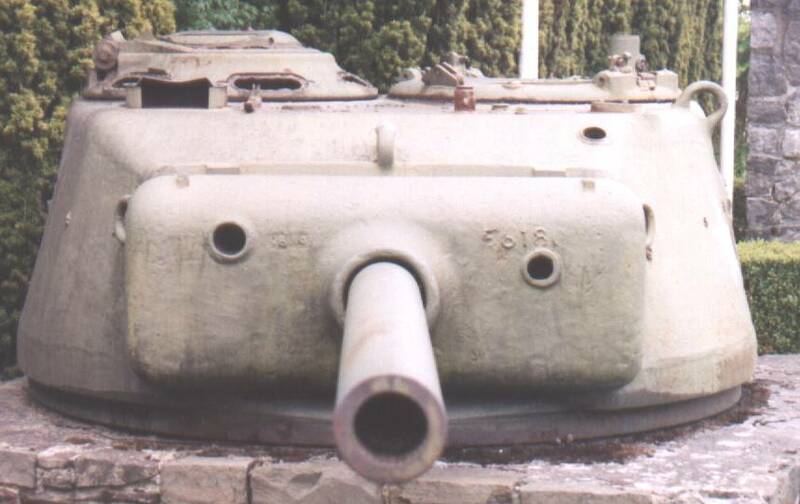 This is actually the same casting used on the T23 medium tank (same part number). 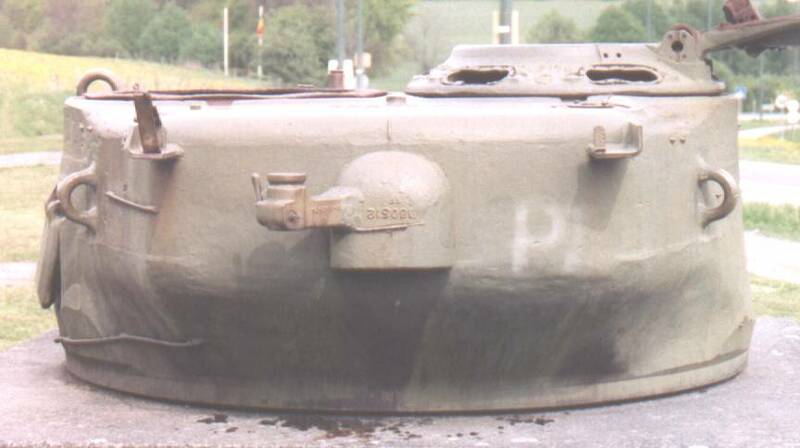 Note the ring on the left side of the turret in front of the loader's hatch. 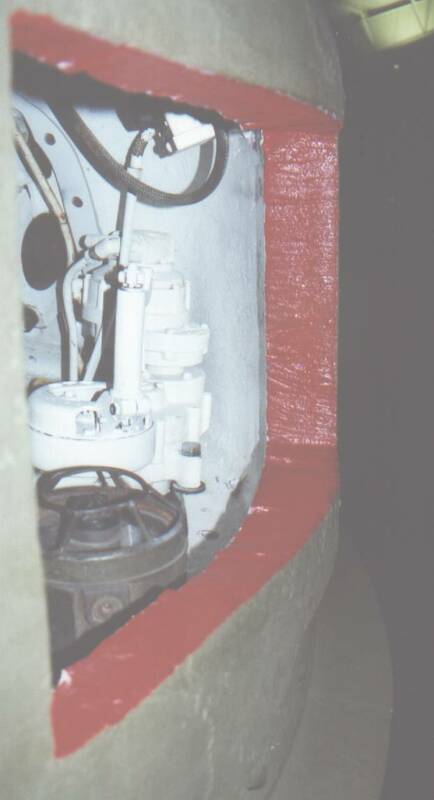 This was an anchor point for a proposed jib crane setup that would have allowed the crew to change the engine, sprockets, and so forth without needing a recovery vehicle (or a hernia operation later!). This particular turret was cast by American Steel Foundries in their Granite City, Illinois foundry. It displays some peculiarities as to mold seam lines, sprue cutoffs, and machining style compared to turrets cast by other foundries. The foundry markings are located in the front center of the roof. 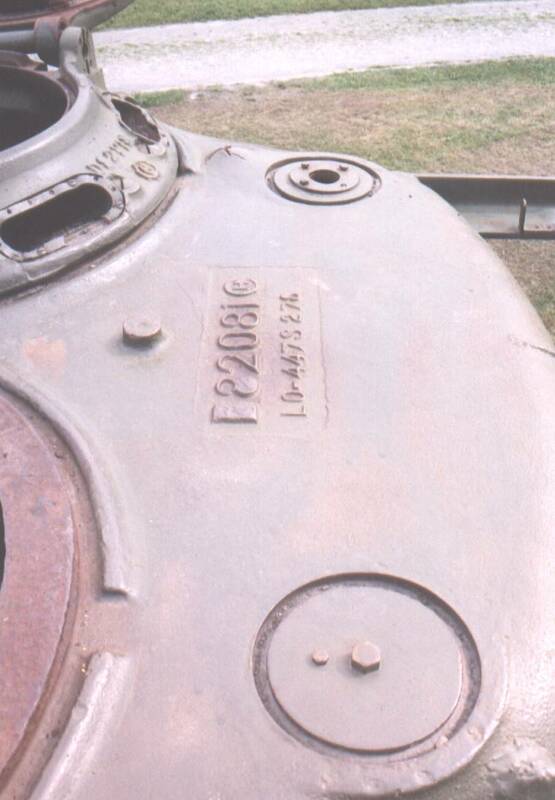 The series of small marks around the sides are weld remnants, probably from gear rails or camouflage supports added in the field. This turret is the same design but cast by Continental Foundry & Machine at their Hubbard Foundry in Chicago. 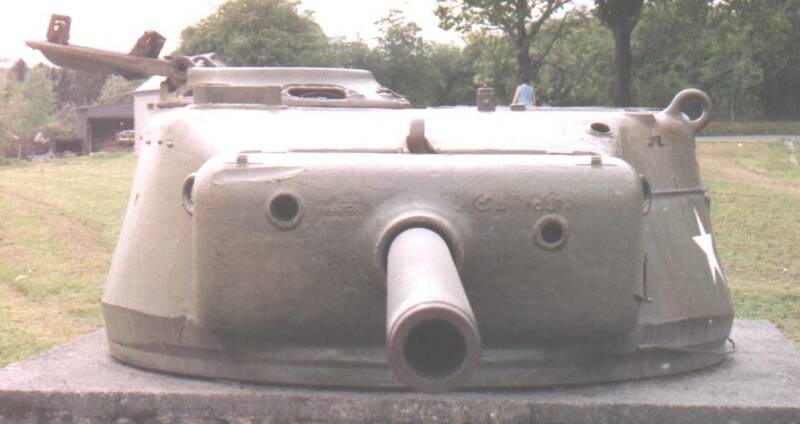 Note the differences with the other turret. 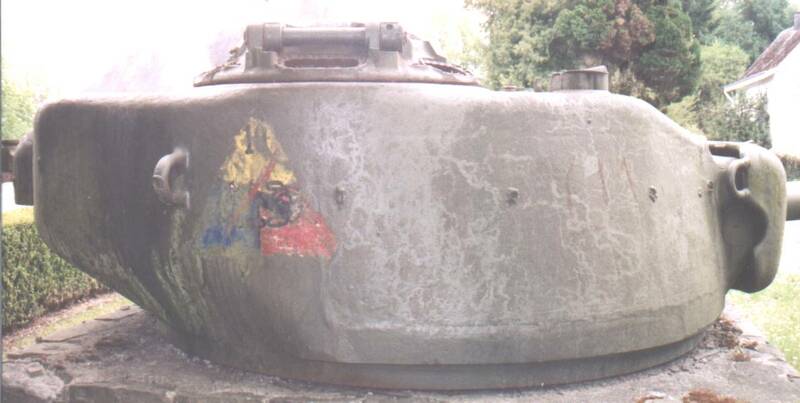 This turret took a hit on the left side that ended up impacting the roof interior immediately behind the TC's cupola. The roof is slightly bulged and cracked, and the cupola bearing race has been sprung. There is another glancing hit on the top right of the gun mantlet. The loader's hatch is missing altogether. The markings in this case are on the top of the bustle. 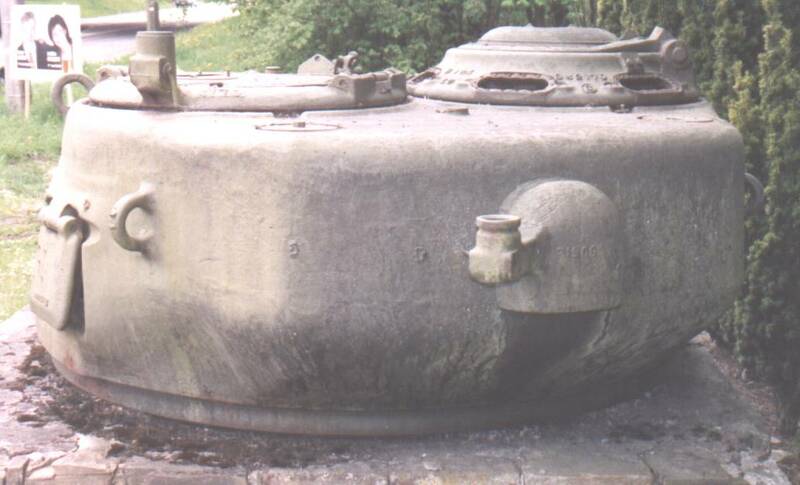 Notice that the TC's cupola was cast by a different foundry, which is normal because there was no reason to match the interchangeable assemblies going into the tank.